Introducing the all-new, sleek redesigned Talon. Multiple anchoring modes, and control from the bow, transom, console, remote or mobile device. Unlock more water, and never miss another fish. Only with Talon. With no hydraulics, the lightweight, space-saving Talon is as easy to install as a trolling motor. You can do it yourself, and save the money on a costly installation. Talon's innovative design - featuring minimal moving parts, no hinge points and a motor that stays above the waterline - ensures that you're always in stealth mode. 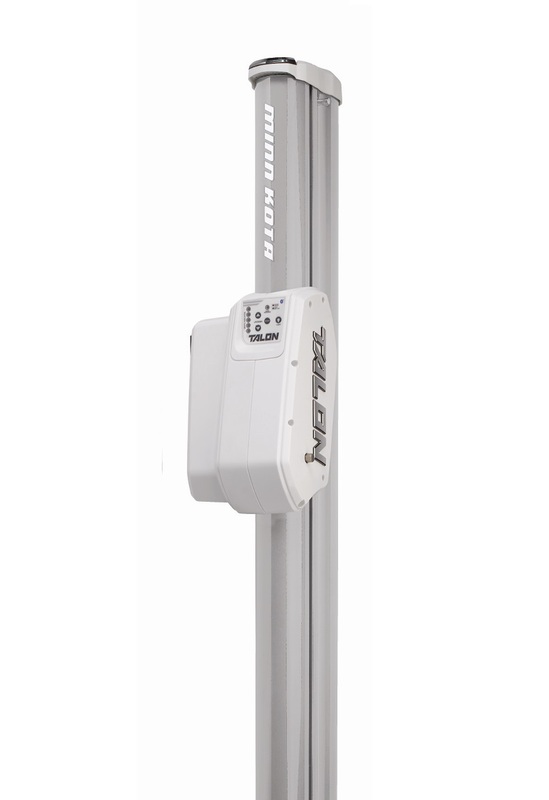 Stays silent below the water - thanks to a motor that is always a few feet above the waterline. The competition's noisy hydraulic pump sits in the bilge, right where the fish can hear it coming. Anchoring in hard bottom isn’t the same as anchoring into mud. With Talon, you can choose between multiple modes to ensure the right hold and fast, easy anchor retraction. Auto Drive Mode: Powers the spike into the bottom with three increasingly aggressive hits. Soft Bottom Mode: For less aggressive anchoring – and easier anchor retraction – in water with a muddy or silted bottom. Rough Water Mode: For heavy wind and chop, this mode performs three consecutive Auto-Drive sequences at 10-second intervals for a triple-strength hold. Hit the button, then get back to fishing. Only Talon has Auto Up/Down, which makes lowering and raising the anchor as easy as using a car’s automatic windows. Utilizing bottom-sensing technology, Talon automatically knows when it has anchored, so you don’t have to hold down the button and wait. Head-to-head, Talon beats any other shallow water anchor in a race to the bottom. Talon deploys vertically in three stages . While the competitor's extended “crab leg” ties up your lines and costs you fish, Talon’s patented sequential deployment is quicker, quieter and stays out of your way. Talon allows your boat to move up or down without affecting the anchor. Its exclusive built-in floating suspension keeps you locked to the bottom, even in rough water. Track anchor depth at a glance. The LED lights on Talon show you how far down you’re deployed with each light indicating two feet of depth. Talon’s indestructible composite spike bends but doesn’t break - even if you try to take off while deployed. And if you do that, Talon’s the only anchor with an audible alert to let you know. Two wireless remotes – and a dash mount holder – come standard to give you push-button control of Talon from anywhere on the boat. All remotes are waterproof and can float. Three custom-fit shields on the bottom and inside of Talon prevent mud or anything else from being pulled back into the unit. The indestructible spike goes out, and nothing comes back in. While other anchors limit you to one position, Talon’s Quick Release Bracket enables up and down adjustment, 30° of pivoting, and easy removal when Talon’s not in use. Over 80 years of trolling motor design and testing taught us how to full combat the corrosive effects of saltwater. And we build that know-how into every Talon, so saltwater won't stand a chance. Talon carries a five-year limited warranty – plus a lifetime warranty on the spike and a five-year warranty on all brackets. Talon's unbreakable composite fiberglass spike is built with outstanding flexibility and can withstand years of abuse – we guarantee it for life. Height on Transom 41" 49" 57"